You can buy pre-made hummus and doctor it up to look lovely and presentable, but why not make it yourself when it is so easy and delicious? 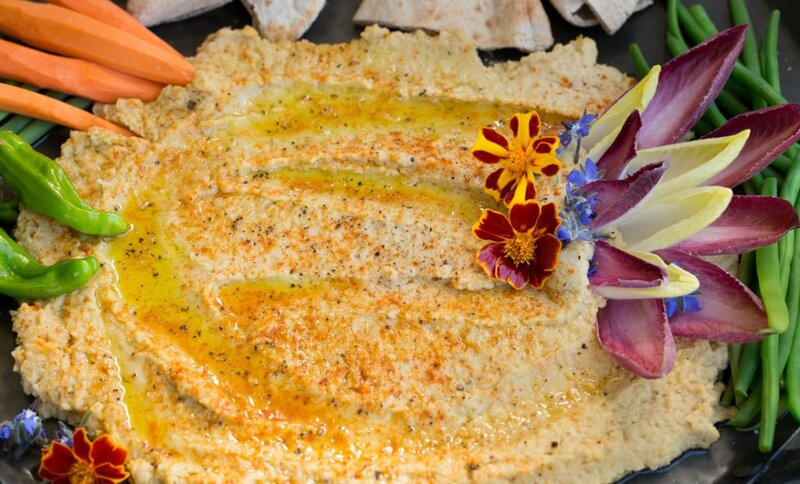 For a nice plateful of hummus, use one can of canned chickpeas (or soak and boil your own) and put in a food processor with a clove of garlic and the juice of at least one lemon. A swirl of olive oil will add richness, flavor and a smooth consistency. Salt works a charm. For variations: What about adding a roasted red pepper or two? Or sun dried tomato? You are the Hipcook! To serve, plop the hummus onto a plate and smooth the top. Make a little swirly-well, which you can fill with olive oil. Sprinkle all over with chopped parsley and a dash of paprika. Serve with toasted bits of tortilla bread, or use toasted pita triangles, lavash, or even pita chips. Veggie’s work a charm — check out “Lucia’s veggie plate recipe in this blog. Here’s to your good health, hummus is wonderful! Aren’t you glad you made it?